This will be the second winter for my pond, but the first in which it contains major living things: plants and fish. I have questions about what I need to do in preparation for winter. Please help if you can. 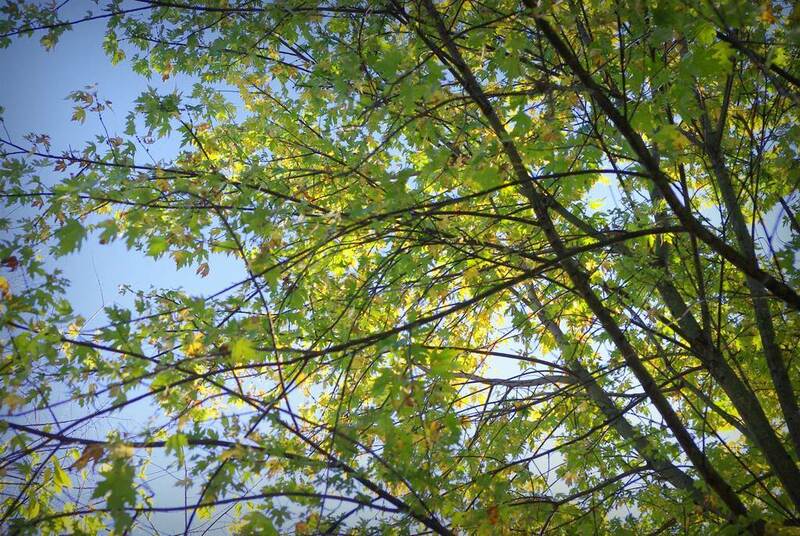 The first issue is leaves. 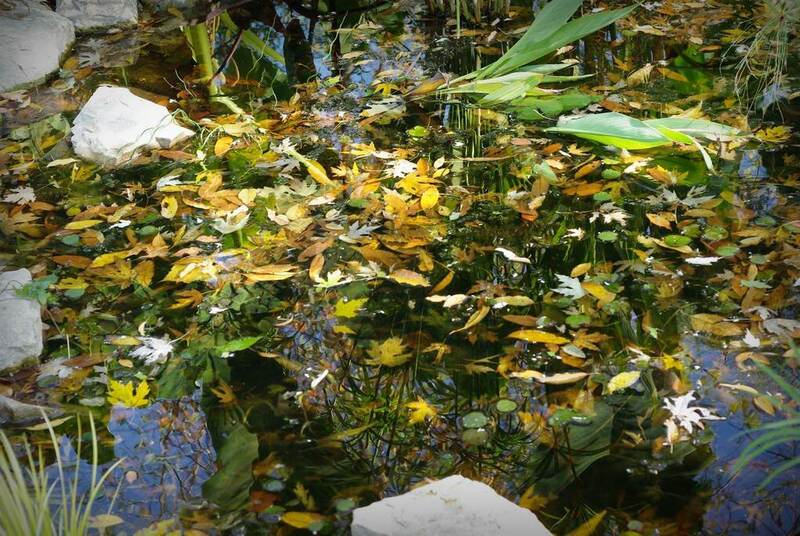 I know that it's bad to let too many leaves decompose in your pond as it will add tannins to the water, decompose and cause methane and ammonia levels to rise, and reduce oxygen levels -- all bad for fish. The problem is, it seems like it's going to be impossible to get them all out. They float for a little while, but soon sink. Besides the leaves I have three types of floating or submerged water plants (frogbit, Anacharis, and hornwort) and I'm not sure what to do with those. They're definitely interfering with the collection of leaves, and I don't know if I should pull some of it out of the pond for the winter. How much of it do the fish need during the winter? Do these plants still produce oxygen all winter long? How do I get the fallen leaves out from the tangle of these plants? Lots of sources say to put netting over the pond to keep falling leaves out in the autumn. I just don't see how that's possible with all of the plants and rocks. Plus, what happens if birds, or squirrels, or raccoons, or even deer get tangled in it? I just don't see how it's practical. 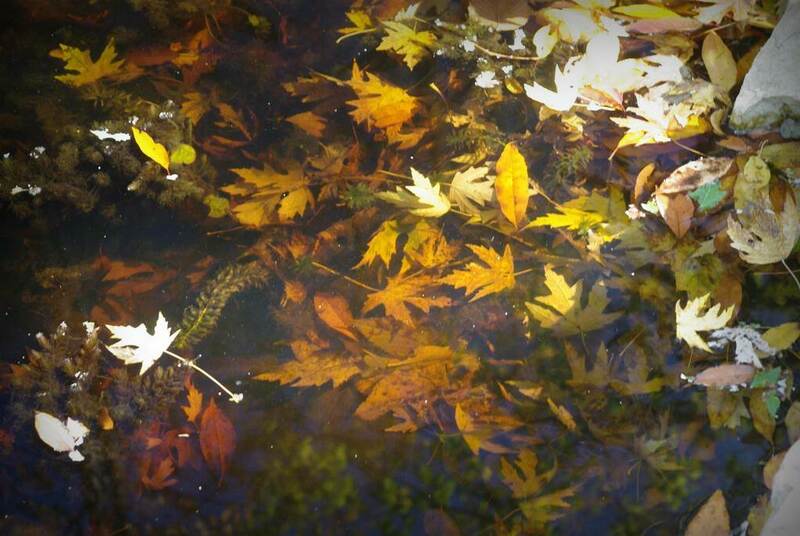 I suppose I'll need to get some hip waders, brave the so cold water and remove as many leaves as possible. Probably remove some portion of the submerged oxygenators too. I'd appreciate any suggestions if you have experience with this sort of thing! I had same problem with previous ponds on wooded lot. I would do my best to net out leaves (and some of the oxygenators - don't worry, they'll grow back from the smallest pieces). Netting works to some extent, but you have to keep elevated or the leaves just weight it all down into the pond and discolor the water (but easier to clean off). We now have ponds without all the trees (non wooded lot), but need netting to keep the blue herons and raccoons (or minks) from attacking the fish - only casualty was a small snake that got tangled up, frogs seem smart enough to find ways in and out of few small gaps. I've found water hyacinths work well to keep netting above water during the growing season and some tall rock or plant on the edge to elevate netting over the winter. Your other option is to do what you can now and clean out and refill pond in the spring - the fish usually survive if there is enough water volume. If you keep the pump recirculating water all winter, that will help with oxygen exchange. We once had a bad winter so the pond iced over and there was no moving water so spring cleanup was extra messy with dead fish on top of normal sludge. Good luck. We chose not to net our pond - 1st winter for us - and have decided we will never make that mistake again! We only have one tree near the pond, but did not consider the shrubs and bushes as well as the wind bringing us gifts from neighbors! You do suspend the net over the water by several feet so the rocks and plants are not an issue. I've never heard of anyone having issues with small - or large - wildlife getting tangled in the netting, but I suppose anything is possible. 3. We already cut down all the water lilies. The submersibles and marginals are next. 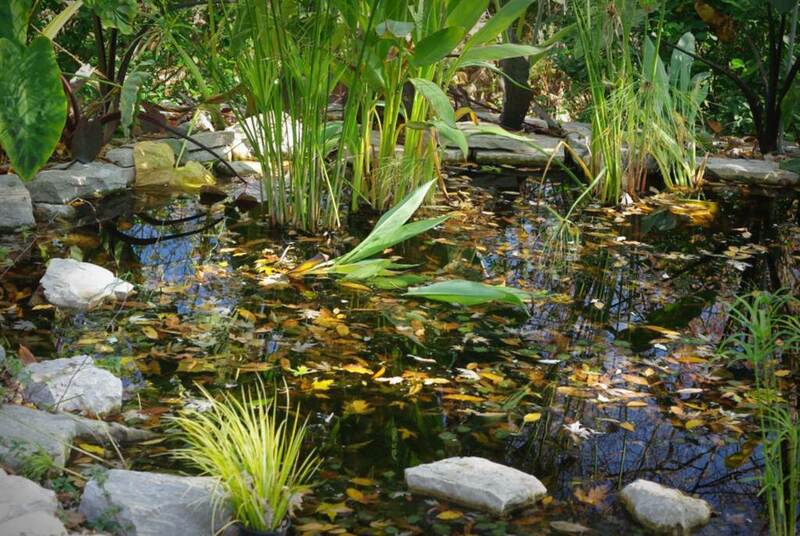 You don't want to leave any plant matter in or around the pond that will rot for all the reasons you mentioned. Submersibles die back as well, so they serve no useful purpose in the cold water. I've also been told that the term "oxygenator" is a misnomer, but that's another story. They do provide shelter for your fish in the warmer months, but your fish will go deep once the water gets cold. 4. Once the pump is turned off for the winter we will run a secondary submersible pump which serves one purpose - to keep an open hole in the surface to allow gases to escape. Some people use a small floating de-icer - same idea. You just can't let the whole thing ice over or you risk fish death. I know you don't run a pump or filter now, but you may want to consider some way to keep a hole open in the surface, if you are concerned that the whole pond will freeze over. I've even heard of people using empty milk jugs. They float on the surface and prevent ice from forming completely. I don't think that would work where I am, but seems to work where below freezing temps are less common. Here in the Chicago area, once we go below 32 degrees, we're generally stuck there til spring, as you know! The ice fishermen love it - the rest of us accept it! Fish will survive the winter... or not. As I said, it's our first winter so we are learning as we go. Our koi right now are still visible during the day, but are very, very still. Some days they are all piled on top of each other on the bottom of the pond which is how we've been told they will spend the winter. We'll see! But we've also been told that fish that are sick or stressed in anyway will most likely die, as the cold weather is very hard on them. We have one that we're watching right now - we'll see if she makes it! I got in the pond last week when we had a few warm days in a row. It was shocking initially, but after a few minutes it wasn't so bad. Cleaning out the leaf debris is definitely easier from the inside! I forget how deep your pond is - ours is almost 4 feet at the deepest point so i was iN the water! 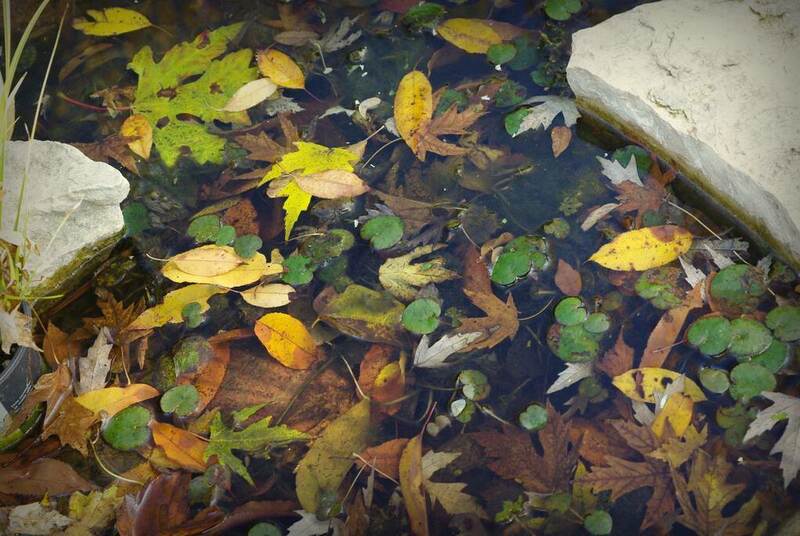 Aquascape (the world's largest pond retailer and installer - located in St. Charles IL) has a good video on their website about getting your pond ready for winter. We get lots of good advice and help from them! Good luck! People have commented to us that a pond seems like a lot of work... but you know it's not REALLY work - it's (water) gardening! P.S. That was a really long comment! Sorry!! When it's time to do maintenance, I get in the pond and start to sort. The submerged grasses go in a big temporary tub, then I divide or not before they go back in the pond after I finish cleaning. The big plants are always in pots, so I remove them to give me space to work. I scoop out acorns, leaves, and other debris, and if there's excess muck, a lot of that comes out, too. I always leave some of the muck, as that's important for natural bacterial balance in the pond. If I have to drain the water in order to work better, I sometimes collect the fish and/or frogs and put them in a temporary tub as well while I clean out the pond. I only have to this one time a year, or maybe once more if it's a big acorn year. I avoided placing the pond under a deciduous tree, so I don't have to worry about too many leaves, but if you have them to excess, then I'd probably consider propping a temporary net on poles over the pond. Perhaps slant it so the leaves slide off the net onto the ground rather than weigh the net down. Sorry I can add nothing to the helpful advice on ponds. Have never had one. 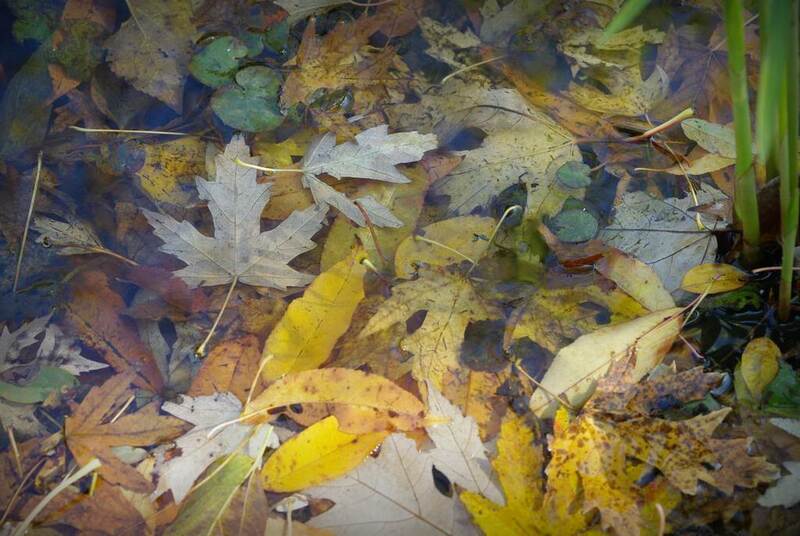 I like leaves but can imagine I would't want them three feet deep in water. I found out that any plant matter that ended up in the pond during the autumn and winter, became food in the spring. Tadpoles eat everything. I could throw whole bunch of grass clippings inside and they took care of it in only a couple of minutes. They did the same thing to dead&submerged water hyacinths and most of the algae growing in the pond. After they leave the water, there's usually no problems until early fall, when algae start growing again, plants start to die off because of cold,... and the whole cycle restarts.